Gold Rush(Net Ent) Classic Slot Guide & Review - Casino Answers! 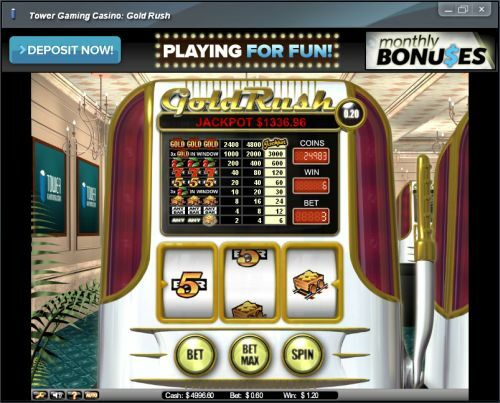 Gold Rush is a 3-reel, 1-line classic slot machine developed by Net Entertainment, featuring a progressive jackpot. You can play the Gold Rush classic slot machine at Bovada. Bets on the Gold Rush slot machine are fixed at $0.20. You can play 1-3 coins per spin. The lowest bet you can make on the Gold Rush classic slot is $0.20 per spin and the highest is $0.60 per spin. Casino Answers recommends that you play the maximum bet at all times to be eligible for the Gold Rush progressive jackpot. The Gold Rush classic slot game is great for casual players especially, due to its limited betting range. You can play up to 1000 autoplay spins on Gold Rush. To play the Gold Rush slot machine, select your bet by hitting the “Bet” button followed by “Spin” or press the “Bet Max” button to play the 3-coin maximum bet. If you hit 3 Gold symbols on the payline on the Gold Rush classic slot and you have made the maximum 3-coin bet, you will win the progressive jackpot. At this time, the Gold Rush progressive jackpot is at $1336.96, which is a pretty large win for a $0.60 bet. You can also win 3000 coins by getting 3 Gold symbols off of the payline. You can win the Gold Rush progressive jackpot now at Bovada! There are 9 winning combinations on the Gold Rush classic slot machine. The complete payout schedule is as follows (1/2/3 coin payouts in parenthesis): 1 Mine Cart symbol (2/4/6), any 3 Bar symbols (4/8/12), 3 Mine Cart symbols (8/16/24), 3 Cherry symbols in the window (10/20/30), 3 5-Bar symbols (20/40/60), 3 7-Bar symbols (40/80/120), 3 Cherry symbols (200/400/600), 3 Gold symbols in the window (1000/2000/3000) and 3 Gold symbols (2400/4800/jackpot). Gold Rush is a very simple, easy to play classic slot machine. It’s great if you’re not looking to blow your whole bankroll and just want to play a few spins on a slot machine. You can play the Gold Rush classic slot machine when you sign up and make a deposit at Bovada! Can I play a free Flash version of the Gold Rush classic slot machine? Yes, you can play the Gold Rush classic slot without downloading any software by playing at the Instant Play casinos at Bovada. You can play for free or play for real money. If you experience any issues with the Flash software, make sure you have the latest version of Adobe Flash Player. Can players from the United States play the Gold Rush online slot game for real money? Unfortunately, American players cannot play this Gold Rush classic slot for real money, but they can play the Rival Gold Rush Classic Slot for real money at Bovada. Can I play the Gold Rush classic slot if I have a Macintosh? Yes, if you’re on a Mac, you can either use the downloadable casino software at Tower Gaming Casino or you can also use the Instant Play software. What Gold Rush slots are there? What is the Net Entertainment Gold Rush Slot? How many gold rush slot machines are there?